Almost since its inception in 1970, North Cascades Audubon Society (NCAS) has been involved in monitoring the Whatcom County marine shoreline between Sandy Point and Point Whitehorn, an area of amazing resources known as Cherry Point. While the marine resources of the area are of such statewide importance that it was designated an Aquatic Reserve by the Commissioner of Public Lands in 2000, Cherry Point also contains the British Petroleum and Conoco-Phillips refineries, Intalco Aluminum, and the potential for further deep-water port development. The potential stresses between these competing uses and the constant pressure for new development are the reasons why we monitor and work to protect what is there. Those of you who were lucky enough to be around Whatcom County in the 1970s and ‘80s might remember amazing concentrations of waterfowl at Cherry Point in the spring of the year. In their 1991 edition of A Guide to Bird Finding in Washington, Terry Wahl and Dennis Paulson give this description of Cherry Point: “During the herring spawning season in April - May very large concentrations of birds may occur here. Flocks of up to 25,000 scoters, Pacific Loons, gulls, murres and others feed on eggs and fish and form an impressive natural spectacle.” Yet, little over a decade later in 2003, in Hal Opperman’s A Birder’s Guide to Washington, Cherry Point does not even rate a mention. What took place in those intervening years was a 90% decline in the population of spawning Cherry Point herring causing the loss of this important food source for migrating sea birds and waterfowl. Scientists have not been able to clearly determine the cause of the population crash. Over the years NCAS has worked on and given input into various issues concerning Cherry Point. In 1977 we opposed the development of an oil “superport” at Cherry Point which would have brought Alaska crude by tanker to Whatcom County to be transshipped to the Midwest by pipeline. In the late 1970s and early '80s we commented on two proposals to build and ship off-shore oil platforms from the site and a few years later, in the early ’90s, NCAS and others came to a settlement which resulted in the withdrawal of plans to build the Cherry Point Industrial Park and shipping pier. 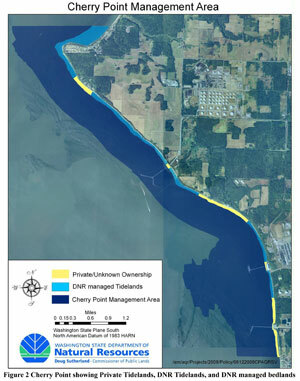 In 1999 NCAS, along with the Washington State Departments of Ecology and Fish and Wildlife and other environmental organizations, came to a settlement agreement with Gateway Pacific Terminal (SSA Marine) which contained extensive conditions, mitigation and resource monitoring necessary to allow them to proceed with the construction and operation of a fourth pier at Cherry Point. That project has not been constructed but recently plans are again moving forward as outlined below. In the early part of this decade, NCAS and a coalition of organizations challenged the expansion of the ARCO dock and accomplished our goals of providing added protections to our Puget Sound waters. Lastly, for nearly two years NCAS representatives have been part of the Cherry Point Technical Workgroup, working to develop a management plan for the Cherry Point Aquatic Reserve. The plan has recently been handed to the Commissioner of Public Lands, Peter Goldmark, for his review and will soon be available for review by the public. Through all of these efforts our aim was not to simply oppose further development at Cherry Point but to attempt to stop further degradation of the area’s ecosystem and to work toward the recovery of the Cherry Point herring stock. Currently, SSA Marine has been updating its permits with Whatcom County and communicating with state agencies concerning the Gateway Pacific Terminal project. It seems that their intent is to move ahead with this project at this time and the chapter feels that county residents should be aware that this major shipping facility will potentially be built on our county shoreline over the next few years. Its purpose will be the transshipment of bulk commodities (e.g. coal) and it will include a pier of about 3,000 feet long by 100 feet wide which will be located between the present BP and Intalco docks, where Gulf Road meets the beach. A trestle will carry the bulk cargo up to the highlands where warehouses and the transshipping facility, with rail and truck access, will be located. The planned facility will probably occupy 200 to 300 acres of land. Some ships accessing the terminal will apparently be the type known as “cape ships” which are about 200,000 dead weight tons and 1,000 feet in length and too large for the Panama Canal. The potential for negative impacts to the Cherry Point ecosystem is obvious. In 1999 we entered into an agreement which would allow this project to move ahead if certain conditions are met, studies completed and ongoing monitoring is conducted. The goals of NCAS remain the same, to protect and, hopefully, to restore the Cherry Point marine ecosystem. Whatever the outcome of this latest development proposal for Cherry Point, we will continue to work toward those goals. Information will be added to this page over time, but for some general information regarding the management of Cherry Point, please see the DNR's Cherry Point Acquatic Reserve pages. Update December 2010: The aquatic reserve was rededicated, and the management plan was formally adopted by DNR on November 18, 2010. SSA Marine continues to bulldoze their project into existence using purely political forces - ignoring the results of previous litigation as well as scientific evidence regarding the harmful effects of the project. Update March 2011: SSA has begun the permitting process, and a joint press release regarding the concerns of NCAS and other environmental organizations has been released: "Coalition Reacts to Planned Mega-Coal Export Operation at Cherry Point". As usual, more info TBA.